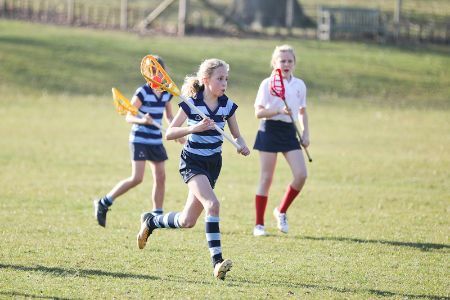 On a beautiful and warm afternoon we had the pleasure of playing lacrosse against Sacred Heart on a dry and sunny day….. quite a change from the muddy and wet conditions we are accustomed to at this time of year! Sacred heart was able to field one mixed team of 5 boys and 3 girls. The athleticism, power and agility of the boys’ game presented our girls with an exciting challenge over the course of the afternoon. We fielded 4 teams, with the aim of involving as many girls in the match as possible. The teams rotated through a circuit: playing a quarter against Sacred heart, two quarters against one of the other three SRS teams, and then a training drill on Timbuktu. 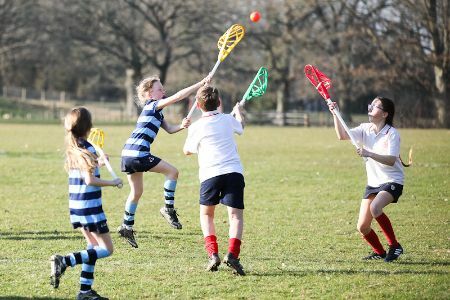 The U11A team was first to play SH. We made a strong and assertive start, scoring 2 early goals. SH was quick to pick up our effective use of blocking and started to employ this strategy in their own game, making it more difficult for us to score. They also grew in confidence in attack and managed to level the game 3-3. In the final minute we seized control once again and, thanks to some quick thinking and great passing, we won the quarter 4-3. The U10B team was up next. They were physically out-played by the boys but still gave it their all. They made a great effort at blocking any SH attacks, despite their goals coming thick and fast, and were able to create some good attacking play of their own and were rewarded with a goal. Score 1-6 to SH. 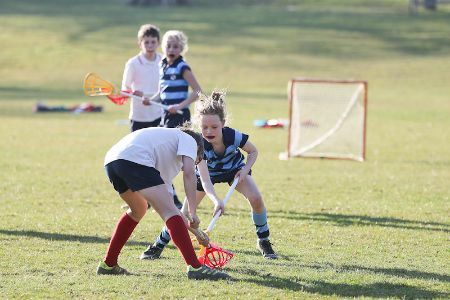 The U10As played the 3rd quarter and were again challenged by the pace, speed and physical agility of the boys’ game. They defended valiantly, blocking the SH attacking plays and making some good interceptions. We picked up cleanly, making some convincing attacking runs. We found it difficult to get the ball into the goal as it was being blocked by players, so we must remember to try and keep this area clear. Final score 2-5 to SH. 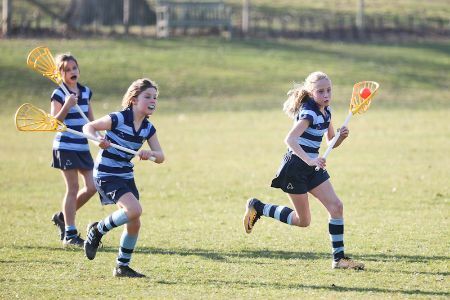 The 4th quarter was wrapped up by the U11B team who were keen to assert their authority on the pitch. They made strong attacking runs and opened the score with a super goal. SH replied and the match went with centre pass from then on! Very evenly-matched, with both sides competing for the ball, picking up smoothly, passing accurately and blocking. A fair and well deserved draw 4-4. Well done to all of the teams. A super afternoon of lacrosse.